I wonder what you consider to have been the biggest business failure of all time? Blockbuster? HMV? Jessops? Those are just from this month. Last year there was SeaFrance, JJB Sport and Comet. In 2011 there was Borders Books, Habitat and Oddbins. In 2010 there was Pontins. In 2009 there was Allied Carpets and Readers Digest. In 2008 there was Circuit City, MFI, Woolworths and Silverjet. In 2005 there was MG Rover. In 2002 there was Swissair. In 2001 there was Enron, Homebase and Poloroid. In 1995 there was Barings Bank and Bugatti. In 1991 there was the Bank of Credit and Commerce International, Pan Am and Polly Peck. But the biggest failure? Or perhaps rather the company with the greatest number of failures? How Can I Overcome Failure? from Stephen Sizer on Vimeo. You could say the same about Apple and a small number of other leading edge companies that consistently hit the market with tried and tested products that gain an instant cult following and build a lasting market share. But they all begin with failures and like Dyson, often thousands of failures. So what is the difference? When failure stares them in the face for the 5126th time, they never give up. So do we overcome failure? Why do marriages fail? Why do families fall apart? Why do businesses fail? Why do teams disintegrate? Because people give up. We all make mistakes, and sometimes they are big ones. Failure can be frustrating, depressing, painful and costly. But failure can also be a learning experience, a stepping stone to growth, a path to maturity, a route of hope as long as we refuse to give up. An incident in the Apostle Peter’s life illustrates this truth. In Luke 5:1-11, we find that despite a whole night of fishing, Peter and his friends haven’t caught a sprat. They were not novices but experienced, seasoned, professional fishermen. Peter would have had a good boat and the best nets he could afford. He knew exactly where to catch the most fish. A failure can become a stepping stone. Lets see what we can learn about how we too can live life the way God intended. Remember God doesn’t want us to fail. He does not delight in our failure. He wants us to make a genuine success in life as we follow his simple instructions. What about your family? Your home? Your assets? Your time? Your boat? God promises us that if we “seek first his kingdom and his righteousness… all these things will be given to you as well.” (Matthew 6:33). Is Jesus asking you today to allow him access to your life for his purposes? If you have never responded to his call on your life, then do so today. If you have never invited Jesus into your life, then I urge you not to delay. The first principle we learn is this: To experience God’s blessing in your life, acknowledge God’s presence in your life. The second principle is you must cooperate with God’s plan in your life. The second time the disciples went fishing, they fished under the direction of Jesus. While they may have had more experience at fishing, they obeyed the instructions of the one who had created the fish. In order to experience God’s blessing, we must not only acknowledge God’s presence in our lives, but we must also cooperate with God’s plan for our lives. Jesus told the disciples where to fish, when to fish, and how to fish. When God is guiding your life, you cannot fail. And because Peter trusted Jesus, he enabled the Lord to take Peter much deeper still. “Don’t be afraid; from now on you will fish for people.” (Luke 5:10). If Luke’s account is chronological as we think, then this promise was made early on in their relationship. While Jesus was revealing Peter’s true calling – fishing for people – it would take another couple of year’s training, several more failures, even denials and deep repentance, as well as the Pentecostal working of the Holy Spirit, before Peter would indeed be fishing for people. But all God’s plans for the rest of his life were all contained in this promise. And the adventure only began when Peter trusted in that second deeper, more awesome promise. Peter didn’t get cynical. He didn’t say, “Lord, I’ve worked 10 hours and didn’t catch anything. That must mean there are no more fish in this lake.” He knew that the fish were there, but that he just hadn’t caught them yet. Just because you haven’t solved your problem doesn’t mean there isn’t a solution. Through failure we can learn the lessons that will help us succeed. God’s message to you is this: Never give up. Try again, but this time, do it with Jesus in your boat. He will make all the difference. 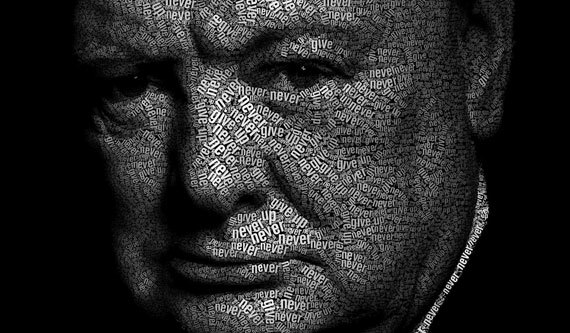 Sir Winston Churchill was one of the greatest leaders this country never deserved. Here are a few of the quotes attributed to him. This entry was posted in Bible, Sermons, Theology on February 1, 2013 by Stephen Sizer.